Have you noticed that pressure cooking is all the rage these days? Well that and Air Fryers! Today though we are talking pressure cooking. My Friend Joanna Burris Lackey from Chef AJ’s Ultimate Weight Loss Program is a dynamite cook. She has created so many wonderful recipes that she has generously shared with our group on the private UWL facebook page. Joanna graciously gave me permission to share her BBQ Lentils recipes here on the blog. Joanna cooks for a large family so her recipes feed a crowd. You can cut this recipe in half if you want to but I like to make the full recipe and then freeze some in two serving containers. This way you always have an easy meal to put together even if you don’t have time to cook. This is my favorite way to eat the BBQ Lentils. I take a pre-baked Japanese Sweet potato cut it in half and heat it up in the Breville Smart Oven Air at 400 degrees for about 20 minutes. If you don’t have an air fryer try putting your pre-baked potato under the broiler to brown it just a little. Put a layer of fresh spinach on the bottom of the serving dish, add the hot potato and the hot BBQ Lentils. I love how the BBQ flavored lentils contrast with the sweetness of the sweet potato. I can’t even describe to you how delicious this is. 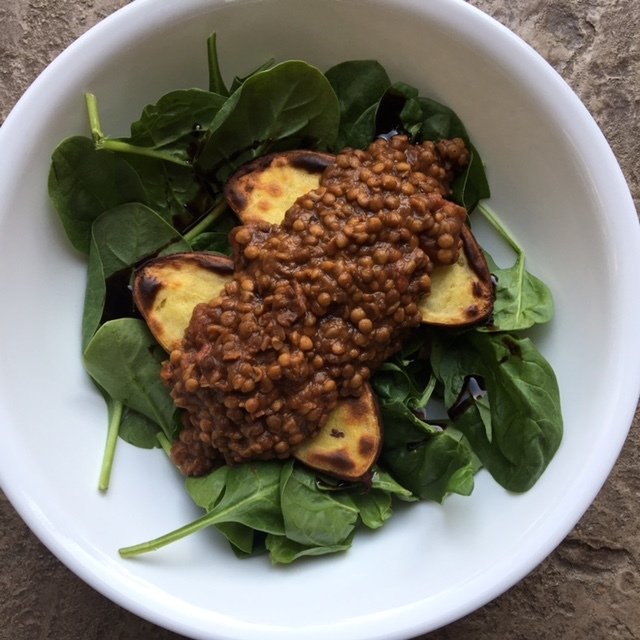 You can also serve the lentils over the top of a baked Yukon Gold potato, a baked yam, quinoa, brown rice, your favorite greens or oven fries. -Place lentils in Instant Pot and add water to 10 cup mark. -Put lid on Instant Pot with valve in sealing position. -Press Bean/Chili function and set timer to 18 minutes. -Make BBQ Sauce while lentils are cooking. -Drain lentils/onions when done and pressure is released. -Place lentils/onions back in Instant Pot to keep warm. -Add tomatoes, spinach to your liking and BBQ Sauce. -Serve as is, wrapped in lettuce leaves or over potatoes, rice, quinoa or non-starchy veggies. Previous Post: « Plant Based Batch Cooking To Start The Year Off Right! What can I substitute for Napa Valley Grand Reserve Vinegar if it isn’t available where I live? Could I use one of the balsamic glazes or reductions? They are not 4% but they are sweeter. I do not live in the US so I cannot get Napa Valley. I have never found the 4% here. Otherwise I was thinking I could use pineapple juice? The balsamic glazes or reductions would be the closest to the Napa Valley Naturals. It is thick and syrupy and a bit sweet. Other options might be to use half balsamic vinegar and half canned pears? I am thinking pineapple juice won’t be thick enough or maybe use canned crushed pineapple? Experiment and see what works – I think one of these could work!